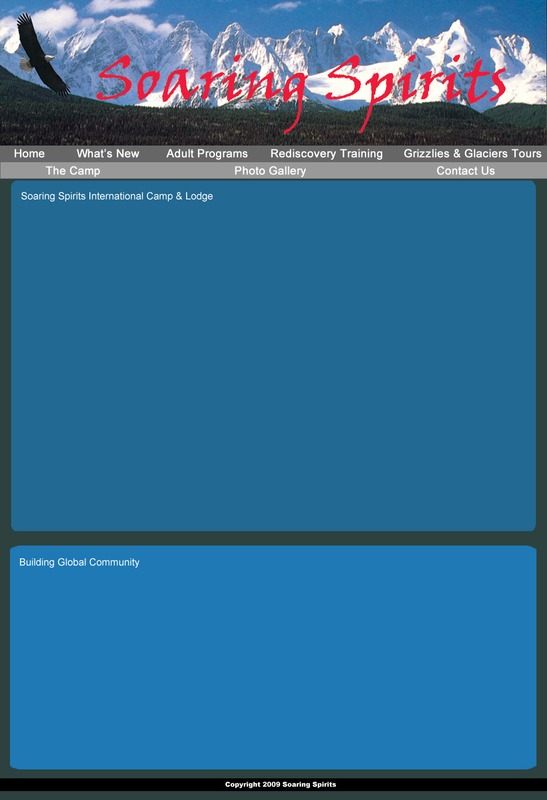 Soaring Spirits is the name of a new international camp and education center located in the most spectacular region of northern British Columbia, Canada. The camp commands a magnificent 175-acres of land along the legendary Skeena River where more than five million wild salmon migrate each summer to their sacred spawning grounds. Dramatic mountains surround Soaring Spirits Camp in all directions with the Seven Sisters Range to the south - the most breathtaking to behold. Here granite spires with hanging glaciers tower to 9,000 ft. and eagles soar on updrafts in an awe-inspiring and ever changing kaleidoscope of rock, ice, sky and cloud. An interior forest of pine, cedar, hemlock, fir, spruce, birch and poplar covers two-thirds of the property and provides habitat for deer, moose, wolves, coyotes, grouse, snowshoe hares, squirrels, marten, ermine, porcupine, black bear and the white Kermode or “spirit bear” of native legend. Mountain goats can be spotted in alpine meadows above the camp and grizzly bears are known to move through this property that serves as a protected wildlife corridor connecting Seven Sisters Provincial Park with Kitwanga Mountain Provincial Park on the north side of the Skeena River. Two large wildflower meadows, where eagles, ravens, hawks, falcons and swallows soar, provide the setting for camp facilities that are as inspired as the landscape. Large canvas wall tents, with original Northwest Coast native designed house frontals, serve as sleeping quarters for guests. Erected on cedar platforms with spacious sundecks and commanding views, these deluxe tents are well appointed with quilt-covered queen sized beds, antique furnishings, rugs and oil lamps to lend luxury and romance to a “roughing it” experience. A beautiful post and beam summer cookhouse and dining hall features sweeping views of the Seven Sisters Mountains and the Skeena River Valley. Cedar shutters open to large screened windows that give the feeling of being fully outdoors even in the comfort of a lodge. Home-cooked meals featuring wild berries, gourmet mushrooms, fresh fish and game combine with the endless bounty of the camp’s large organic garden and orchard for delicious, nutritious and truly memorable meals. A variety of programs are offered throughout the summer months catering to different interests. Our “Community Service Camp Set-up” program May-July is open to volunteers at a very modest cost. The annual “Summer Salmon Institute” (July 30th to August 9th 2011) draws together students, teachers, government officials, community leaders and people from all walks of life to a 12-day experiential learning adventure. This program is university accredited and brings together top researchers and professionals in the field. A 10-day “Rediscovery International Guide Training” program (August 20-30, 2011) teaches bush crafts, direction finding, food gathering, hiking, canoeing and other skills necessary for operating healthy and safe wilderness recreation programs. With a special emphasis on natural history interpretation in a dozen different ecosystems, and immersion into the rich cultures of four distinct native nations, this program appeals to a broad range of interests. Custom tours using the Soaring Spirits Camp as a central point for discovering the surrounding area, are yet another type of program on offer. From October 11-21, 2011 a tour titled “Grizzlies, Glaciers & Ghost Towns of Northern British Columbia & Southeast Alaska” will take clients on a never to be forgotten journey well off the beaten path. Click on to the itineraries for any of our summer 2011 programs to learn more about them and enroll in an experience that will truly set your soul free. From the official opening ceremony on a chilly day in May 2007, the Soaring Spirits Camp has been bringing the world community together in wonderful ways. Seven hereditary chiefs from villages within the Skeena watershed gave their blessings to the camp following the ceremonial lighting of the first Council Fire by the matriarch of the Kitwanga Frog Clan, whose traditional territory the camp lies within. While Tibetan prayer flags (blessed for the occasion by the Karmapa Lamma) fluttered in the breeze, international youth from Thailand, Guyana, Dominica and Bolivia shared dances and ceremonies from their respective cultures. Youth from the Gitksan, Tsimshian, Inuit, Wet’suwet’en and Neduten First Nations answered with time-honored traditions of their own during an opening feast that celebrated the occasion and the extraordinary bounty of the land. Renowned native artist Ken Mowatt created original designs depicting the four Gitksan crests: wolf, frog, eagle and fireweed, while Haida artists Jalun Edenshaw and Wayne York donated a bear mother and intricate bent box design. Val Morgan, a celebrated native artist and master chef from Kitwanga, has been generously feeding the camp building crews with her incredible meals for years while many non-native neighbors continue to support Soaring Spirits Camp in every way they can. Volunteers from across Canada, USA and Mexico and Thailand have come to lend a helping hand as the dream of an inspiring place to rediscover oneself, other cultures and the wonders of the natural world continues to unfold. given for the garden and local artists generously offered their time and talents creating beautiful house frontal designs for the camps’ canvas wall tents.